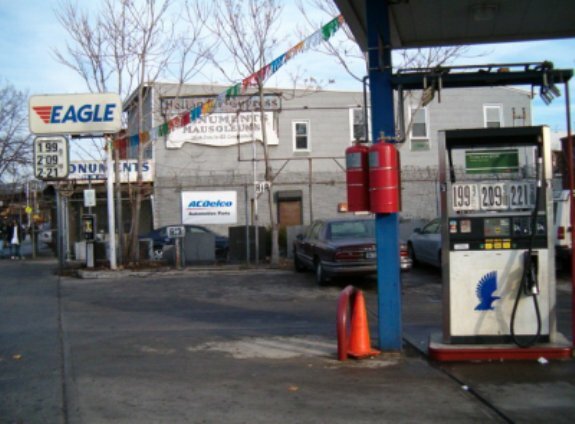 Eagle Service Station, Inc. facility on Jamaica Avenue across the street from Cypress Hills Cemetery in Woodhaven, NY. Photo taken December 22,2004 by J. Eric Freedner. 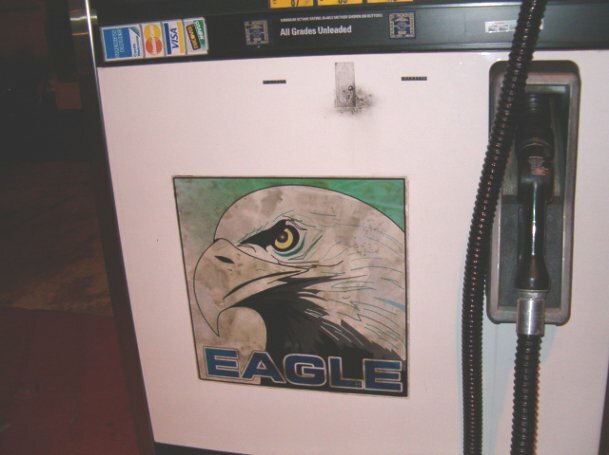 Close-up of the Eagle pump at the Jamaica Avenue location, showing a logo not unlike the old RICHFIELD OF CALIFORNIA Eagle. 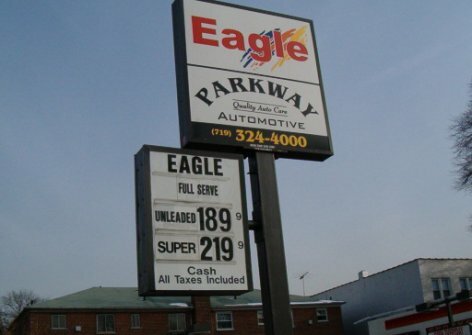 EAGLE has been in business for at least 10 years in Brooklyn and Nassau Counties, New York. Photo taken Dec. 22, 2004 by J. Eric Freedner. Night shot of the EAGLE on Linden Boulevard in Elmont, NY. (Yes, there's a SUNOCO right next door.) 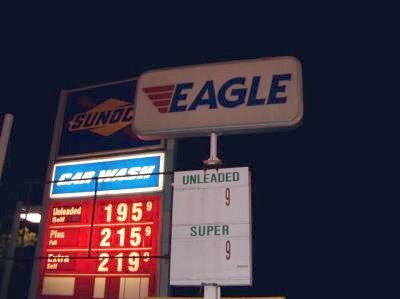 These stations are close to the freeway exit so it's a high-volume area for this lucky Eagle, which I believe is still usually open (despite there being no prices displayed). Photo taken Christmas evening 2004 when station was closed. Photo by J. Eric Freedner. An "evil Eagle" on the pumps of the Elmont station. Where Nereid Avenue meets Barnes and Gunther in Wakefield, Bronx, an EAGLE with fluffy New-Art smears as its logo! Taken Dec. 2004 by J. Eric Freedner. 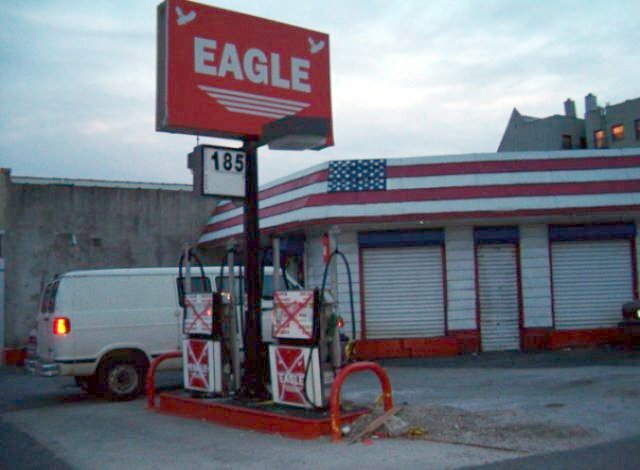 The Nereid Avenue EAGLE station looks a lot like CITGO in its paint scheme and pump designs! Taken Dec. 2004 by J. Eric Freedner. 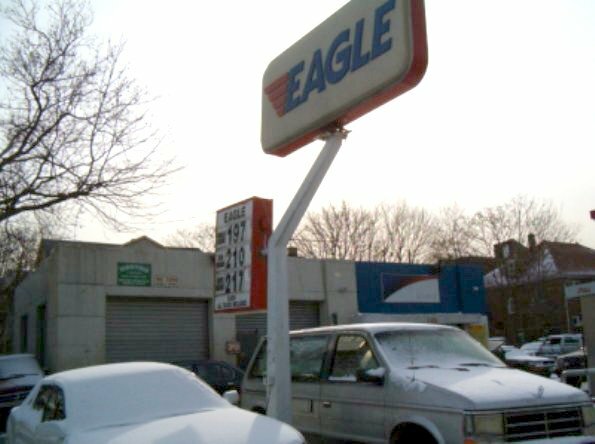 Not 6 blocks away from the Nereid Avenue station, at S. 10th Avenue and W. Sandford Boulevard, Mount Vernon, Westchester County, I spotted this "traditional" EAGLE sign but with a different pump/station design. You can see the station design here, a blue-red-white swoopy thing. Somewhat of a bad area of town, and I stopped in a driveway so I didn't stay real long here. Location is right over the Westchester/Bronx County line. 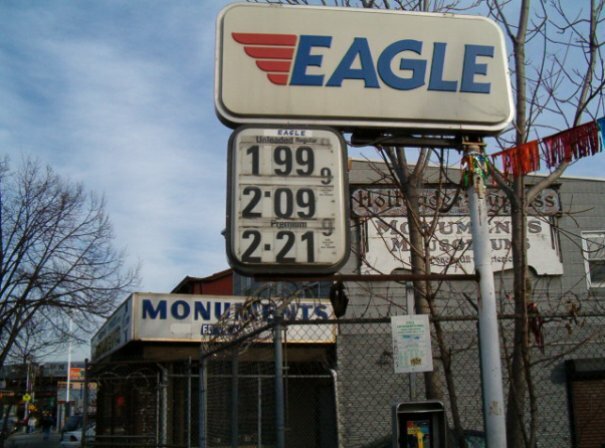 Photo taken 12/28/2004 by J. Eric Freedner..
A small, defunct EAGLE on North Street at Chauncey, New Rochelle, NY, discovered 12/24/2004. 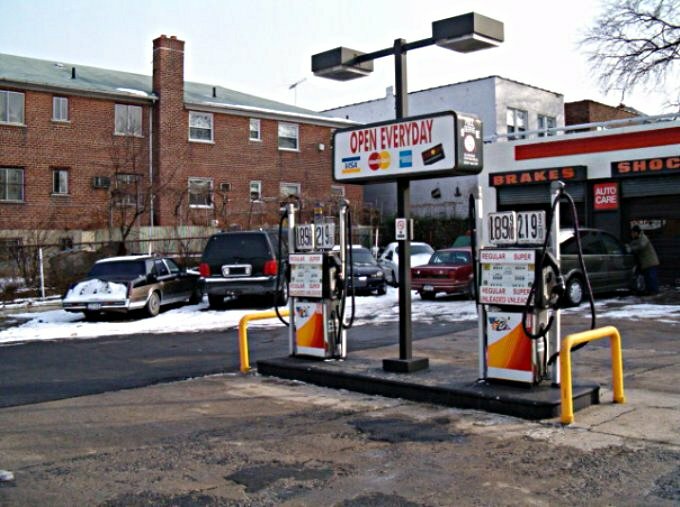 Someone spray-painted the X's across the pumps to show there was no gas for sale. Photo taken by J. Eric Freedner.